*This post is sponsored by La Crema Wines. All opinions here are my own. 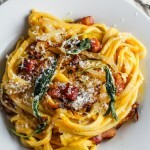 You can find the companion recipes over on the La Crema blog. As soon as the first hint of spring arrives, I start thinking about rosé wine. Perhaps I’m just more susceptible to social trends and marketing than I think I am, but somehow, that first chilled glass of rosé, preferably consumed on a terrace on a sunny but cool evening, has come to embody the fact that summer is coming. In March and April I test the waters with a glass here and there, usually consumed indoors while looking longingly at the outdoors, wishing spring would hurry up and get here. And then May hits, and it’s all rosé all the time (#roséallday, people). 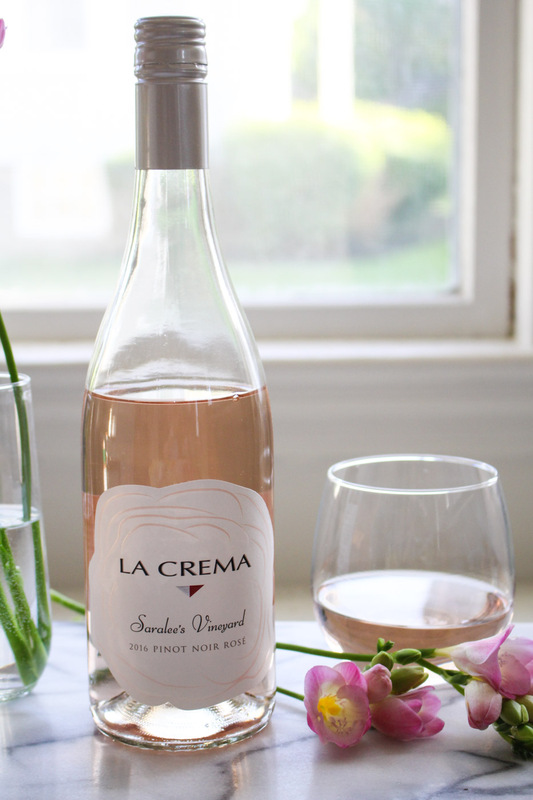 In celebration of the start of rosé season, I’ve put together a pairing dinner using La Crema’s two rosé wines – the Monterey Pinot Noir Rosé and the Saralee’s Vineyard Pinot Noir Rosé. In the past my dinner series collaboration with La Crema has taken us to Japan for Izakaya, Latin America for a spicy Thanksgiving menu, and Italy for a summery seafood feast. Now, for spring and for rosé, we’re going to France, where effortless appetizers and simple but elegant entrées are king. And also there’s a lot of pink wine. There are four courses in this menu. First, a Spring Crudité Platter. If you are thinking to yourself, “how boring,” bear with me a moment. This is not a platter of dry baby carrots and too-thick ranch dressing sitting, ignored, in a corner. This is a vibrant, effortless display of spring’s best vegetables. 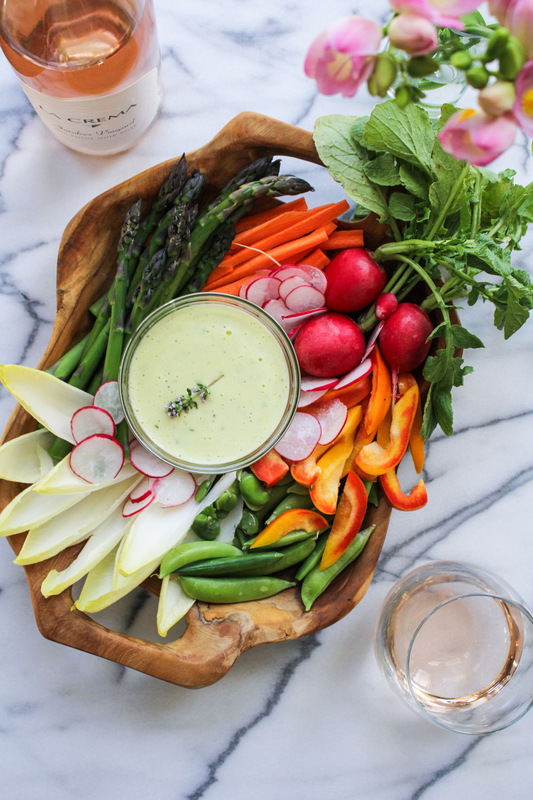 Blanched asparagus, snap peas, tender spring carrots, bitter endive, spicy radish slices, and sweet pepper… all served with an addictive, pale green herb aioli. Crudité platters can be very classy. Second, a simple and savory Goat Cheese Tart with Peas and Prosciutto. It’s similar to a quiche, but thinner and denser. It’s also so, so good. 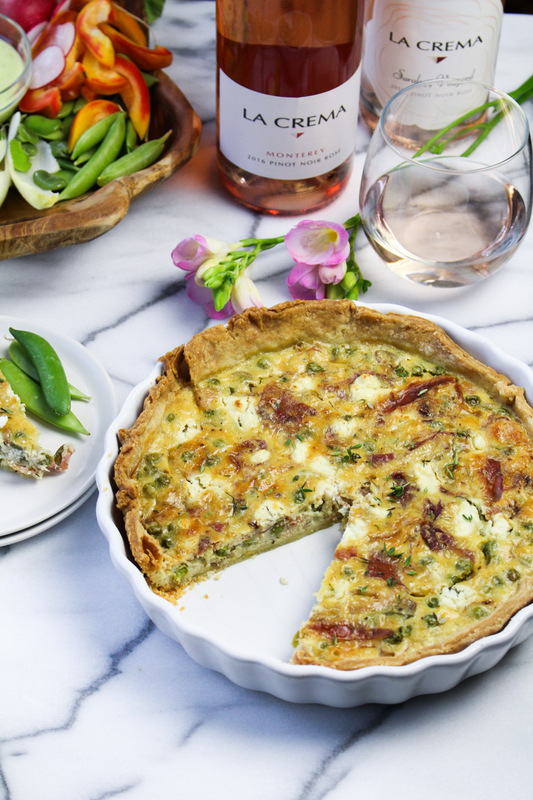 Even if you’re not tackling the whole French Rosé Dinner menu, give this goat cheese tart a try. 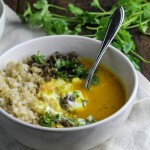 It’s a great multipurpose recipe to have in your cooking arsenal, and you can vary the vegetables with the season. 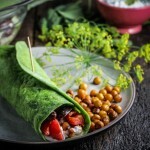 Equally good warm or cold, a thin slice is a perfect appetizer for dinner, while a big slice makes a filling breakfast. The main course is a lovely Baked Halibut Provençal – halibut marinated in lemon and olive oil and served over a rich tomato, olive, and caper sauce. It’s inspired by the time I spent in Provence years ago, on my first vacation with Trevor. We rented an apartment at the top of a hill in Cassis and spent a week there. It was a tiny little place with an expansive patio, and every day after beach hopping we would hike up the hundreds of dusty stone steps with bags of vegetables from the market hanging on our shoulders. We were using most of our disposable income on the apartment so we ate simply – ratatouille and grilled chicken. 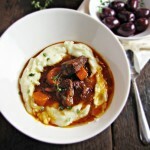 This recipe takes it’s cues from those meals. A simple but perfectly cooked protein accompanied by a sauce full of seasonal vegetables and herbs. And to finish off this lovely French dinner, a cake! Or, mini Strawberries and Cream Chiffon Cakes, to be precise. 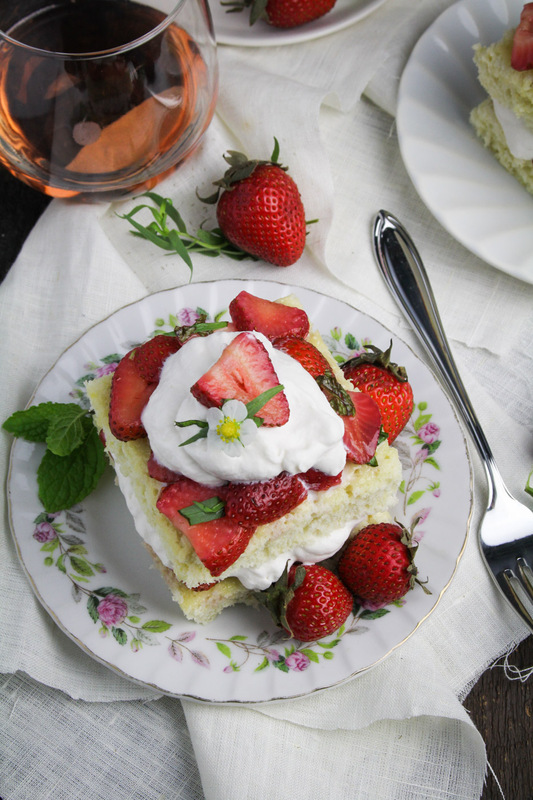 I wanted to make a French version of strawberry shortcake, one of my favorite spring desserts. 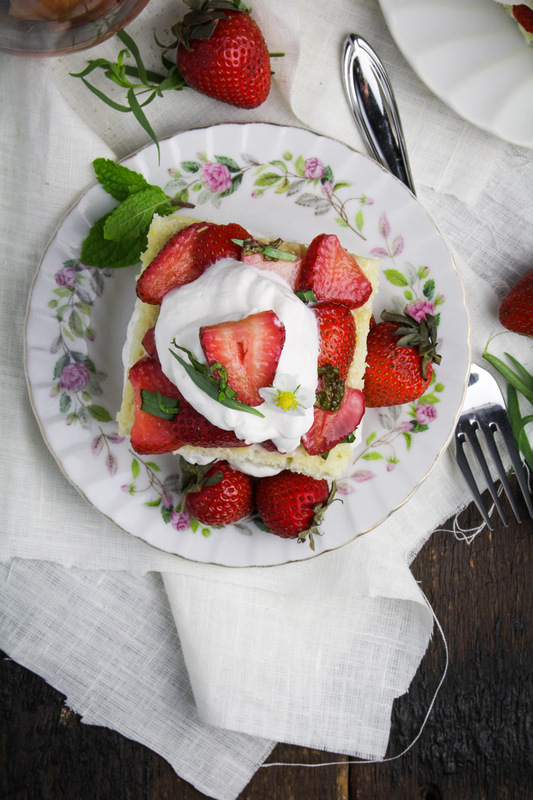 I swapped the buttery shortcakes for a light and airy chiffon cake, and layered the chiffon cake with strawberries and whipped cream. 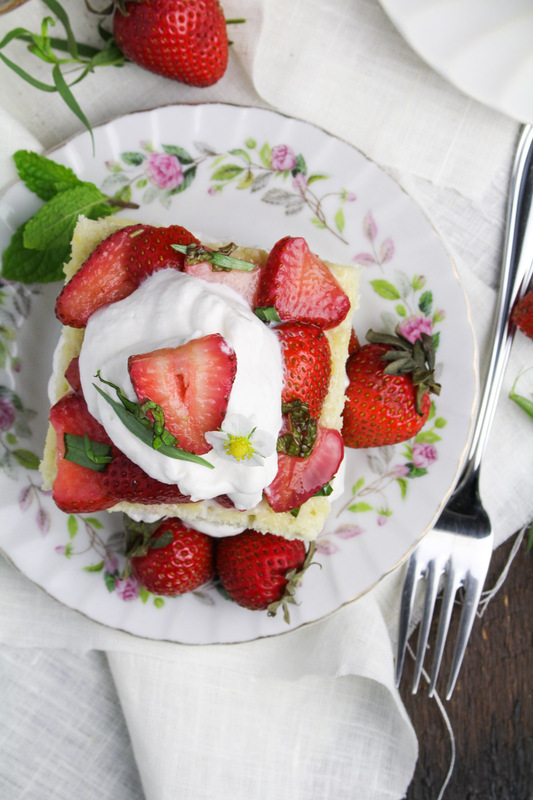 A few more tweaks upped the elegance – there’s rosé in the cake batter and mint and tarragon in the strawberries. This cake was everything I was hoping it would be. I was worried that it would be worse than your standard strawberry shortcake. Strawberry shortcake is, after all, pretty difficult to improve upon. But the chiffon cake – soft and airy – was the perfect thing for soaking up all the delicious strawberry juices. 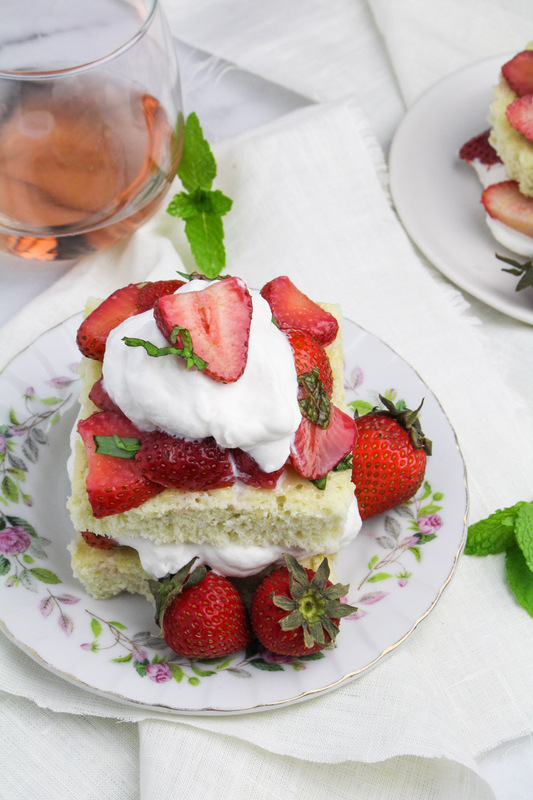 The rosé wine flavor was just barely present in the cake, and you could taste the mint and tarragon in the strawberries, too. It was the kind of dessert that I thought about multiple times while sitting at work. That’s the surest sign of a win, in my book. 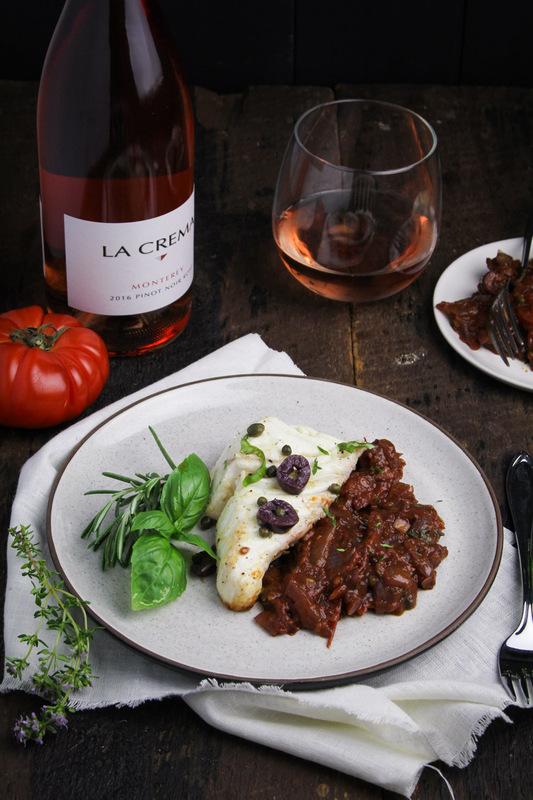 You can find the recipes for the first three courses on the La Crema blog: Spring Crudité Platter, Goat Cheese Tart with Peas and Prosciutto and Baked Halibut Provençal. 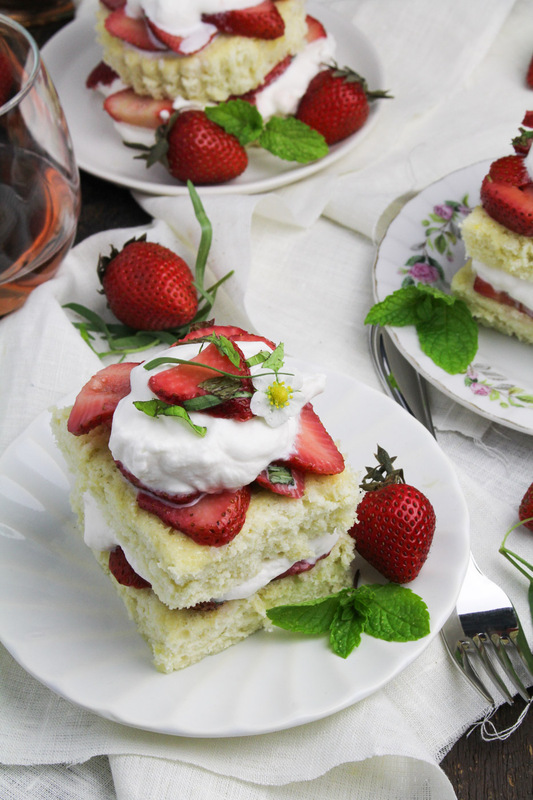 The Strawberries and Cream Chiffon Cake recipe is below! 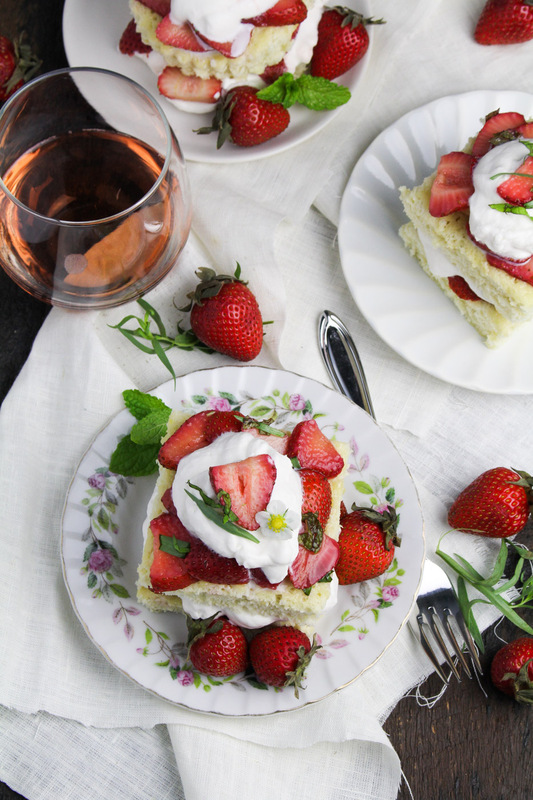 A French take on Strawberry Shortcake, using light and airy chiffon cake as the base. 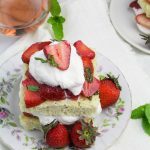 The chiffon cake has rose wine whipped into the batter for a hint of flavor, and the strawberries are macerated with fresh tarragon and mint. Chiffon cake recipe adapted from the Joy of Cooking. For the cake: Preheat the oven to 325°F. Spray an 11×17 inch sheet pan lightly with cooking spray, then line with a piece of parchment paper. Set the prepared pan aside. In a large bowl, whisk together the cake flour, sugar, baking powder and salt until evenly combined. Now add the wet ingredients – the egg yolks, wine, canola oil, and vanilla and beat thoroughly, until a smooth batter is formed. Set this batter aside. In a large, clean bowl, begin beating the egg whites on high speed (or vigorously by hand). After about 30 seconds, stop and add the cream of tartar, then continue beating. Beat until the egg whites are very stiff and glossy – they should completely hold their shape. Add a third of the beaten egg whites to the bowl with the batter and gently fold with a spatula until the two mixtures are evenly combined. Now add the remaining egg whites and fold in until evenly combined. 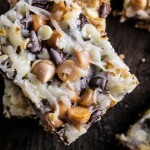 Scrape the batter into the prepared sheet pan and use a spatula to spread evenly. Bake until the top of the cake springs back lightly when pressed, about 20 minutes. Run a knife along the edges of the pan to release the cake. Let cool to room temperature, then invert the cake on a piece of aluminum foil and peel off the parchment paper. Set the cake aside or refrigerate until ready to use. For the filling: Place the sliced strawberries in a large bowl with 1/3 cup of sugar and the minced mint and tarragon leaves. Stir to coat the berries with sugar. Set aside and let macerate for at least 15 minutes. You can also cover the berries and let them sit in the fridge for up to 24 hours. When you are ready to assemble and serve the cakes, beat the heavy cream on high with the remaining 1/4 cup sugar until it is whipped enough to hold it’s shape. 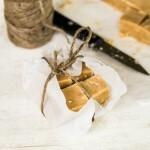 Avoid over-beating as it will take on a butter-like consistency. Stir in the vanilla. Cut the cake into 12 squares that are approximately 4 inches wide. For each cake, place one cake square on a plate. Cover with 2 or 3 large spoonfuls of strawberries and their juice, arranging neatly. Spread some whipped cream on top, then repeat the layers – cake, strawberries, whipped cream – once more. Garnish with a strawberry. Serve immediately.